There are different glands in the human body from where various kinds of hormones are secreted, which help in stimulating various important functions in the body. Among them, the thyroid gland needs special mention. The thyroid gland is a butterfly shaped gland, which is located right at the base of the neck. There are various functions which are controlled by this gland in the body. However, there might be problems in this gland leading to various health disorders. The thyroid can be underactive (hypothyroidism) or overactive (hyperthyroidism). To treat these problems, it is important to see a doctor at the earliest. 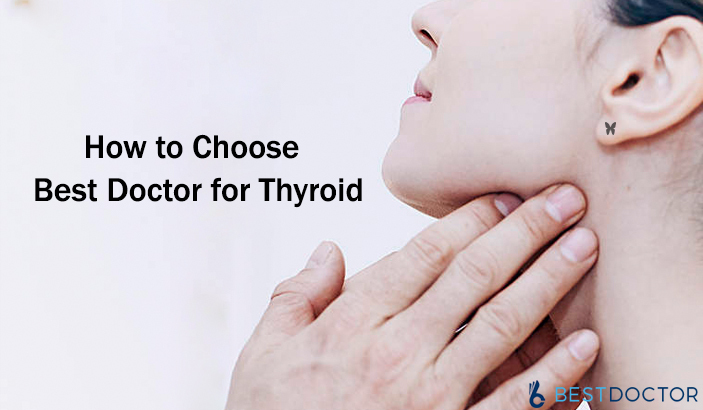 The next question that arises is how to choose best doctor for thyroid problems. There are specialists who deal with problems of endocrine glands and they are the best people to deal with these kinds of problems. It is quite surprising to see that choosing the best doctor for thyroid treatment might not be an easy job to do. The process of finding the right doctor might be quite daunting and complicated. When thyroid problems are diagnosed easily, they can be handled by a general physician or medical practitioner. Regular blood tests need to be done to understand the levels of thyroid and the dosages of the medicine should be adjusted accordingly. In case the problem fails to come under control, the general physician might recommend visiting an endocrinologist for further check up and investigation. You can ask a doctor for recommendations of an endocrinologist. If you want to know how to choose best doctor for thyroid, you must follow the treatment process closely. Some doctors like to stick to old treatment methods for thyroid, while others will try new methods. They might ask for carrying out various kinds of investigations. Most doctors will only ask to do TSH (thyroid stimulating hormone) test. But a proficient doctor will ask to do Free T3, Total T3, Free T4 and Total T4 for overall thyroid testing. Investigating all the variables helps in getting the larger picture and proper treatment can be done. The best doctor for thyroid treatment will check all variables and then start treatment accordingly. You might be seeking advice from a general physician regarding your thyroid issue. However, if you are in any kind of doubt, you can always ask an endocrinologist regarding your problem and seek expert consultation. The endocrinologist might ask you to do further tests and investigations to be sure whether you are getting the right treatment. Again, if all the tests are already done, the endocrinologist might just look through them and offer his expert opinion. Your general physician might not be able to answer many questions that you have in mind regarding thyroid, but the endocrinologist will be able to do the same. Thyroid cancer is a growing ailment which is affecting millions of people globally. When detected at the right time, this cancer can be treated and cured. But in most cases, the problem is not diagnosed at the right time and the delay proves to be deadly. In case you have been diagnosed with thyroid cancer, do not lose and waste time at all and look for the best doctor for thyroid cancer treatment. There might be need of a surgery for treating the problem and for this there are specialized surgeons who can treat the problem and cure it completely. After the surgery, there are many precautions that need to be taken till the patient recovers completely. Radiation therapy or chemotherapy might also be recommended by the surgeon so that further chances of the disease relapsing can be averted. There are chances that in spite of getting treatment for your thyroid problems, you might look for a second opinion just to be sure that the treatment you are getting is the right one or not. What is important in this regard is how to choose best doctor for thyroid treatment as part of the medical second opinion. There are many doctors who claim to provide the best thyroid treatment, but when a second opinion is sought, it might be found that the treatment done was not right. In most of the cases, there is complain regarding the dosage of the medicine that is recommended. And this is where an expert opinion comes handy. An expert endocrinologist will study all the reports and suggest the right dosage of medicine. In fact, he will also suggest doing the tests after a few months to understand the progress made. He will adjust the dosage of the medicine accordingly depending on the test results. Looking for a doctor and a specialist has become easier now, thanks to the advent of the internet. Most of the doctors and specialists are enlisted in various medical directories and people can find their information easily. Not only this, most of the doctors have their own website too, from where you can know in details about the doctor, his qualification, his specialization, experience and so on. Your worry as how to choose best doctor for thyroid treatment comes to an end with this solution. Along with this, it is also recommended to read some reviews of the doctor and understand how good he/she is. Make sure that the reviews are read from trusted sources so that authentic information is obtained. Now that you know the way of how to choose best doctor for thyroid treatment, you can be assured of getting the best treatment for your thyroid issue. Next PostWhy is My Tongue Peeling?